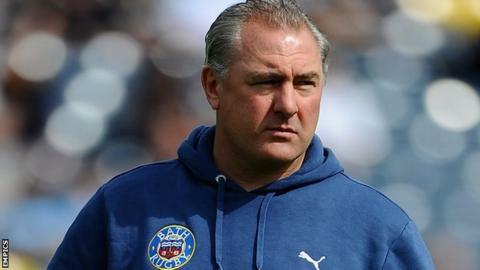 Bath have said Gary Gold left the Premiership club because of a disagreement over his management role. Gold arrived as head coach 18 months ago but was moved to director of rugby over the summer, with Mike Ford taking charge of first-team matters. Bath initially said Gold's departure on Monday was down to a "restructure". In a statement made on Friday, they said: "It became clear that the club and Gary were not able to agree on how to define the role." Bath chairman and owner Bruce Craig added: "I would like to thank Gary for all his efforts over the last 18 months. "He has helped the club advance hugely and has contributed to the club's present success, and indeed become a personal friend. "He will always be welcome at the Rec and I have no doubt that he will prove a tremendous asset wherever he goes from here." I am very proud of what we have achieved as a group in being able to make Bath a formidable force. The 46-year-old previously coached at London Irish and Newcastle before taking over at the Rec in May 2012, replacing Sir Ian McGeechan. Bath finished seventh in the table last term and are now sitting in third, six points behind leaders Saracens. The club have won their last nine games in all competitions and are top of their Amlin Challenge Cup group following Saturday's 55-8 victory over Mogliano. Gold himself added: "It is with deep regret that my time as director of rugby at Bath has come to an end after amicable and respectful discussions. "I am very proud of what we have achieved as a group in being able to make Bath a formidable force, and it is testament to this great group of players that the team are currently sitting in such healthy positions in all competitions. "I have no doubt that Bath will go from strength to strength in years to come, and I sincerely wish them all the very best of fortune. "I have thoroughly enjoyed my time at Bath and have particularly enjoyed - and continue to appreciate - the constant support from an incredible group of Bath fans." It is thought the club are on the lookout for an attack/skills coach to work with head coach Mike Ford and first-team coaches Toby Booth and Neil Hatley, who all arrived with Gold. England rugby league coach Steve McNamara was heavily linked with the job but the Sydney Morning Herald reported on Thursday he has opted to take a job at job at Sydney Roosters.